Rice Krispy Treats are a classic and they have a lot less sugar than you’d expect when you make them with brown rice, which won’t spike blood sugar as quickly as refined sugars. Substitute frosting on cupcakes with flavored cream cheese, like chocolate, honey nut or strawberry. Allowing the cream cheese to briefly warm up to room temperature will make it easier to spread. Remember that applesauce can replace vegetable oil in any recipe in equal amounts. This will cut down on the fat content of classroom treats while still keeping them moist. Offer popcorn balls as a real food option, making them with simple and natural ingredients yourself. 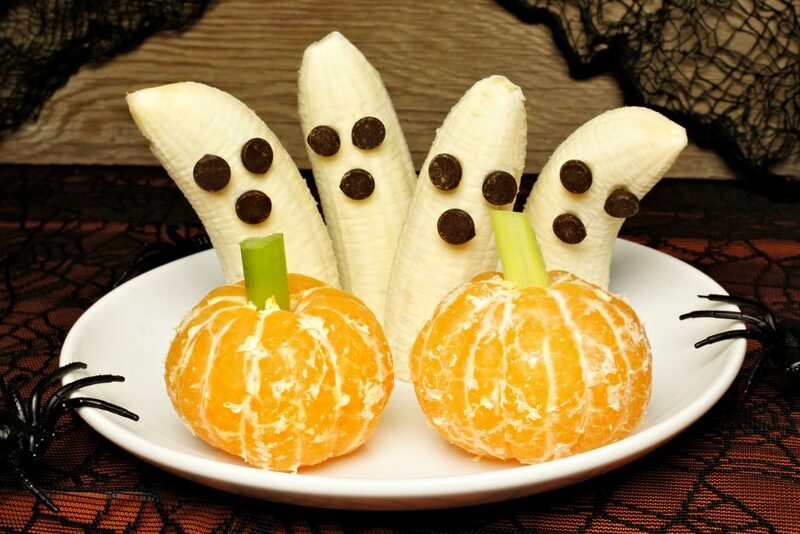 Get the kids involved in making healthy Halloween treats. Whether it’s chocolate covered pretzel sticks or Jello cut into fun Halloween shapes with cookie cutters, getting kids involved in the process means less time spent eating and more time spent on fun! Check out these tips for kids with food allergies.